Rainy Day Date Night. No better time to test out one of my new style clutches. She was a MAJOR hit!!!! Easy to tuck under my arm & still able to clutch my umbrella - while making sure to still keep the cute factor! She got more than a few stares! Purse: By CurlyInTheCity on Etsy. Blazer: Urban Outfitters. T: Nordstrom. Necklace: F21. Watch: Michael Kors. Jeans: Joe's Jeans. Flats: Tory Burch. Nails: OPI-On Collins Ave.
Love the bag darling-so talented! Love!! I really need to order one! I love the mixed print!!!! you are kidding me with that clutch...i love it! ok, i will be begging you for one once i get back from mexico (leave sunday)! eric will kill me for getting yet another bag, but i need it! Obsessed with the new mixed print style of your clutches. NEED! Gotta get my first one first before you keep creating new beauties for me to obsess over. Love the new clutch design! Also love the outfit- so cute! I have been craving a leopard bag so this is perfect. I put my order in this morning!! 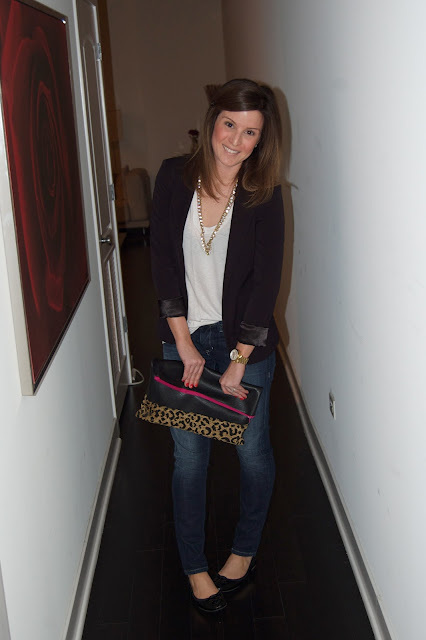 Love you effortlessly chic outfit with your awesome new clutch!! The pop of pink is perfection. amazing ~ absolutely adore the new clutch style!!! I have been looking at your clutches for so long and I'm loving the new designs! So cute! stumbled across your blog and love it!! amazing job with this clutch! can i place an order for a Midi in this style? should i msg you through etsy? okay you look adorable and have the best skin...and i think you should prepare for an onslaught of sales. that leopard two tone is going to take over your shop. holy moses. 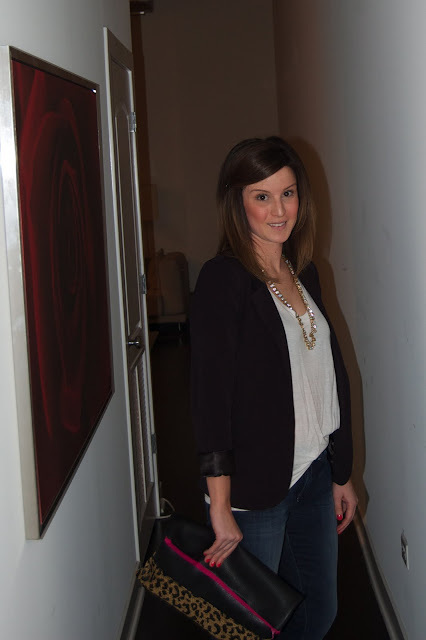 Love the new clutch style - youre staying busy making all these fab clutches! I just ordered but now I'm loving the new style, too! Love the clutch! LOVE LOVE LOVE LOVE! OMG, I LOOOOOOVVVEEEEE the new design!! So happy I came across another Chicago blogger! Cute blog - now following. And, I love the clutch! i LOVE urban's blazers. i collect them. that clutch is outstanding! I LOVE the foldover style and the pink zipper! Seriously, Taylor, you're so talented! 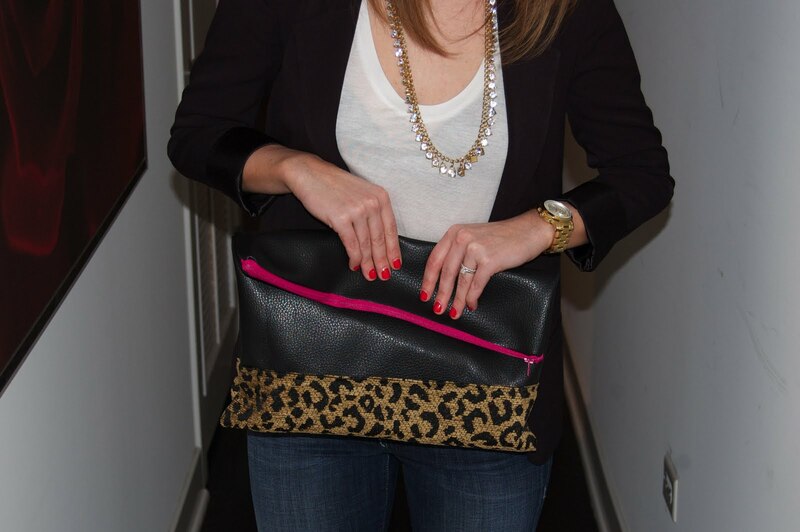 I love the fold over with the leopard! If you ever make a green large one let me know! I love them! Nice work Taylor! Oh my goodness, I looooove it! It's gorgeous! I need this in my life! Adorable! I love your haircut, I saved it to consider when I get mine done soon! Mine is long and losing any interest it has, so I need something fresh!